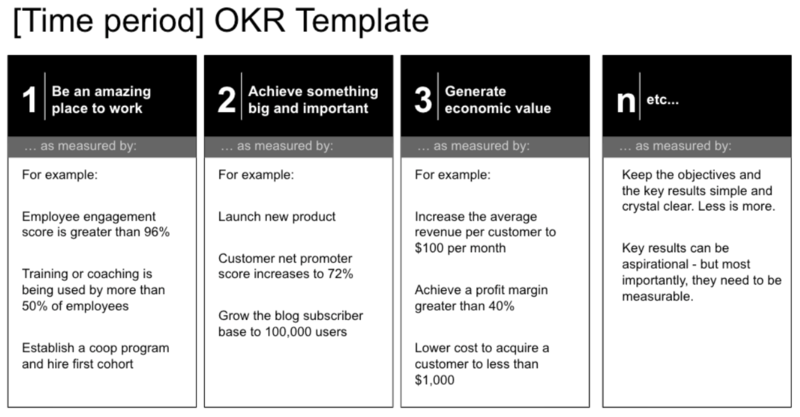 This is the third of three pieces on how to create a solid, measurable plan for growing your company. The first piece looked at the importance of setting a vision and a mission for the company. Then, I discussed the yearly planning cycle. This final piece sets a series of steps for turning the long-term vision for your company into a measurable plan for the coming year. In recent posts, I’ve written about how to create a vision and mission for your company, and how the vision and mission get worked into the yearly planning cycle. Today, in the third and final piece about the road from vision to reality, I want to present a step-by-step formula that will help turn the ideals contained in the vision and mission into real, measurable results. What I’m presenting here is based on what we do at Klipfolio. The exact formula we use may not be right for everyone. But I strongly believe that each company has to create a planning process that measures results. Your vision and mission need to be defined before you dive into any meaningful strategy session; otherwise, participants will be spinning their wheels. Participants need to know where the company wants to end up, and why, before figuring out on how to get there. Defining corporate values is just as important as the mission and vision. You not only need to know what mountain you want to climb, but also why and how. For a detailed look at creating a vision and a mission, see this piece I wrote a few weeks ago. Who to include in the strategy session? We brought together the entire management team and a few other important players in the company. It was a relatively large group (just under a dozen people), and within reason a bigger group can be a good thing. People who have a hand in defining goals will be motivated to turn them into reality. Having a clear set of objectives and key results to shoot for will help bring the future into focus. We then worked through the key results for each of those objectives. A key result is something we can measure. We can set measurable results over three years, but also for the year ahead. For example, for ‘Be the world’s leading ecosystem for metrics,’ one of the key results for 2019, the measure might be to have 300,000 unique visitors to our website each month. By the way, we brought in an outside consultant to help us with the strategy session, and if we found that one idea or concept was bogging us down, we ‘parked’ it for discussion later if there was time. This is where things start to get real. After imagining the future from 30,000 feet, we started looking at what things we could actually do to achieve the results we were aiming for. For example, what do we need to do to increase the number of unique monthly visitors to our website by the end of next year? Having a one or even three-year timeline for results can actually take a burden off your shoulders. Instead of feeling you have to do everything right away, or feeling that a task is so big that it’s impossible to know where to start, it’s now possible to imagine it in steps. And you realize it won’t all have to be done at once. To decide what we should tackle in the next year, we went through what I call an ‘intense sticky-note exercise.’ The process ended up taking up a good part of our day. We did our brainstorming around answering the following question: By the end of 2019, what major initiatives will we have had to tackle to make progress on reaching our goals? Each idea was written on a sticky note, and when we had a bunch we started grouping them into clusters, with the idea that we should be able to describe each cluster with a single “slogan-like” statement - one that would fit on a tee-shirt. There are always lots of things you want to do, but the crux of any planning exercise is deciding what you actually will do (and how you will do it). So the next step of our strategy session was to prioritize the clusters. We had created about 15 different clusters of initiatives we felt we wanted to undertake to achieve the results we are aiming for. We certainly could not do all 15 things. If we could only tackle five of the 15, which would they be? This was probably the most difficult part of the exercise, and a real eye-opener because we had to evaluate each of the 15 clusters to see whether they moved us along towards our long-term goals. We debated long and hard, and came up with five major initiatives we needed to undertake to move forward in 2019. Some of those five things aligned with our three-year vision – and surprisingly, some did not. In other words, we had identified new things we needed to do. We would never have uncovered them if we had not done this exercise. We ran our strategy session on a Friday. This allowed participants to spend the weekend reflecting on the discussion. And when we all met in the office on the following Monday, we were able to bring some perspective to the next step of our discussion. On Monday we still had the same four objectives. But the things we planned to do to achieve them had changed because of the Friday exercise. For example, on Friday afternoon we identified the onboarding of new customers into our application as one of the top five priorities for 2019 - a “growth” mindset, obsessing about the efficiency of our funnel. This was something we decided we really needed to become good at, but which we had not captured in our three-year plan. It is critically important to be able to measure your progress towards your targets. If you don’t, it will be difficult to know whether you are making any headway. So the next step, well before you put any new plan into place, is to create simple ways of measuring your progress. For each of our four objectives, we have now crafted only two key results that measure our progress very clearly, often with a yes or no answer to a question. For example, one of our objectives is to be an amazing place to work. One way to measure that is by having a retention rate greater than 95%. Have we met the 95% objective, yes or no? Goals have to be clear, and having simple measures is one way to get clarity. And if you can’t measure it, it’s not clear. As I mentioned earlier in this blog, my previous post explores how I work through the yearly planning cycle. The allocation of budgets and staff is a part of that planning process. The exercise I have laid out here is critically important to helping allocate money and resources judiciously. If you’ve created a good plan, with prioritized, measurable goals for the coming year, you will be able to feel good about your financing and human resources decisions. Allan Wille is a co-founder of Klipfolio. He’s also a designer, a cyclist, a father and a resolute optimist.